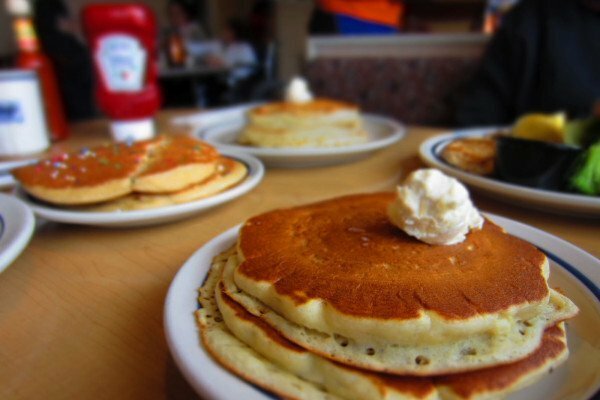 International House of Pancakes, or IHOP for short, has been renowned for its delicious breakfasts and a menu that has been expanded to include lunch and dinner menus. Some critics, however, have said that while IHOP does have a wide selection of food items on their menu, none, in their opinions, have nutritional value. This is unfair, to say the very least because there are healthy options at IHOP if you know how to choose which food items to order. Specifically, order those in IHOP’s Simple and Fit Menu which has more than 30 options all under 650 calories only. In fact, the Simple and Fit Menu has even created combination options for their breakfast food items. If your idea of “simple and fit” has always been egg whites and bran flakes, you have a surprise coming with IHOP’s idea of what Simple and Fit is all about. Here are some of the “big” breakfast choices you can order without worrying about all of that food settling on your hips or legs, including omelets served with fresh fruits that may be between 320 and 430 calories per 10 to 20 gram-servings. Vegetable Omelet with Spinach, Mushrooms, and Tomatoes: served with a side of your choice of fresh fruit, this one has only 330 calories per serving. Berry Berry Brioche French Toast: a healthy option because it is grilled and not fried and topped with antioxidant-rich sliced strawberries and fresh blueberries. Just pass on the whipped topping and powdered sugar. Oatmeal with Banana Slices, Brown Sugar, and Milk: brown sugar, milk, and banana slices fill you up for longer only for 260 calories while leaving you room to still enjoy a cup of flavored coffee or orange juice. Garden Omelette: fresh green peppers, tomatoes, onions and mushrooms prepared with Cheddar cheese. Ask your server to hold the cheese if a low-fat option is not available. Pumpkin Cheesecake Pancakes: four pieces of pancakes made with cheesecake bites and real pumpkin pieces topped with whipped topping. This is all of 630 calories that can last you well into lunchtime. Two x Two x Two for Me: scrambled egg substitute served with a couple of strips of turkey bacon plus two buttermilk pancakes have 400 calories for a healthier breakfast that has 29 grams protein. Whole Wheat French Toast Combo: scrambled egg substitute, two strips turkey bacon, and two slices whole wheat French toast with banana topping total 470 calories and 39 grams protein. Just Right Spinach, Mushroom & Tomato Omelette: served with fresh fruit, even non-vegetarians will enjoy this 350 calorie-egg substitute, fresh spinach, onions, mushrooms, diced tomatoes, and Swiss cheese omelet. Rooty Tooty Fresh N’ Fruity Pancakes: classic IHOP signature pancakes of four buttermilk pancakes with the topping of your choice – glazed strawberries, cinnamon apple compote or peaches – at only 120 calories. Pick-a-Pancake Combo: if you must have this, choose the one with the lowest calories – the Cinnamon Apple at 363 – and ditch the whipped topping that easily contributes to the 25 milligram-cholesterol content. Balsamic-Glazed Chicken: this chicken breast is grilled and then topped with onions, sautéed mushrooms, balsamic glaze, and diced tomatoes and served with green salad and broccoli. Calorie count for this poultry dish is 510 calories. Tilapia Hollandaise: grilled tilapia topped with hollandaise sauce and steamed broccoli. While this has only 370 calories, the sodium is pegged at 830 milligrams. Ask your server to reduce the amount of seasoning before the tilapia is grilled. If you expect anything with turkey as low-calorie, IHOP’s Classic Roasted Turkey Dinner has all 960 of calories and 125 milligrams of cholesterol. Surprisingly enough, IHOP’s Classic Ham Dinner – consisting of hickory smoked and caramel-glazed ham served with broccoli and mashed potatoes – registers at 630 calories only with zero cholesterol and only nine grams of saturated fat. While the Citrus Chicken Pecan Salad has only 660 calories, its cholesterol content is pegged at 125 milligrams. Your better option is the Honey Lime Chicken Salad at only 420 calories and fewer cholesterol milligrams at 40 or the House Salad at 249 calories, if you are willing to compromise the 65 milligrams of cholesterol that it contains in spite of its all-vegetable ingredients. The Monster Mozzarella Sticks are, thankfully, only 326 calories with only eight milligrams of cholesterol. Have these and the Honey Lime Chicken Salad and you can get through until dinner with only a total of 746 calories. Or have the Baja Fish Sandwich (232 calories, zero cholesterol) without the tartar sauce and pair it with the Citrus Chicken Pecan Salad for a satisfying, below 2,000-calorie meal.